You know it’s nearing spring cleaning time when you turn down brunch plans with friends in favor of deep cleaning your apartment. But according to Amy Shapiro, RD and founder of Real Nutrition, your apartment isn’t the only thing craving a rejuvenation—your microbiome is due for a refresh too. After a winter of being cooped up indoors, fighting off colds, and reaching for more comfort foods, your microbiome can get thrown out of whack, according to Shapiro. Her solution for getting back to max gut health? “Eating a well-balanced diet rich with prebiotics as well as probiotics will help to reset and either build or support the microbiome,” she says. Because things like spring cleaning tend to linger on your well-intentioned to-do list without ever getting crossed off, here’s some incentive. Sounds easy enough, but because things like spring cleaning tend to linger on your well-intentioned to-do list without ever getting crossed off, here’s some incentive: “[Your microbiome] affects bodily functions from health, weight, digestion, disease prevention, and more, and the research is really only just beginning,” Shapiro says. So yeah, it’s pretty important. And if you know anything about gut health, you know that when your gut is in tip top shape, everything else—from proper digestion to less bloating—feels a whole lot better. A key component of overhauling your gut (however weird that may sound) is probiotics, because of course. 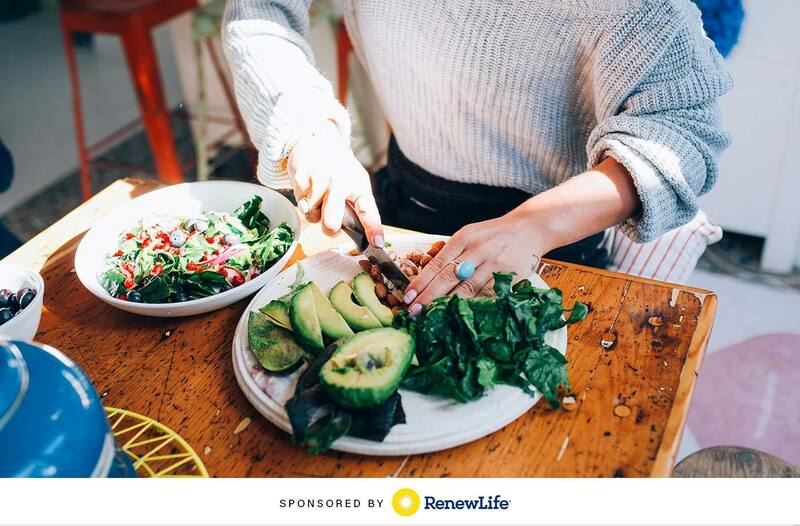 Renew Life Women’s Complete 90 Billion supports digestive and immune health with a once-daily, delayed-release capsule to help get the ball rolling toward a totally refreshed gut situation. Keep reading to learn how gut healthy foods and supplements can give your microbiome the spring refresh it needs. Just like you have to do some KonMarie-style organizing before you break out the rubber gloves for max sparkly clean effect in your home, you also have to do some prep work in your gut before the probiotics can work their magic. But instead of getting rid of anything, step one of spring cleaning your microbiome involves adding prebiotic foods to your diet. Chowing down on some of Shapiro’s favorite prebiotic foods such as greens, artichokes, mushrooms, fennel, squash, garlic, leeks, onions, berries, and apples helps to create a healthy gut environment where probiotics can thrive. “High-fiber foods like veggies, fruit, and whole grains provide the food the good bacteria will feed off of to remain healthy and alive,” Shapiro says, and keeping probiotics alive is the name of the whole gut-health game. Instead of Marie Kondo-ing your gut, step one of spring cleaning your microbiome involves adding prebiotic foods to your diet. Probiotic-rich foods (like Greek yogurt, kimchi, kombucha, and kefir) can help on the good bacteria front, but because they usually provide single strains of probiotics in low doses, you aren’t really getting the most bang for your buck. Shapiro notes that when you opt for a supplement (like Renew Life Women’s Complete 90 Billion, which contains 90 billion live cultures and 10 different probiotic strains), it eliminates the guessing game of whether you’re getting enough CFUs and a variety of strains or not. “[With supplements], you know exactly what strains you are getting and generally how many are hitting your stomach and surviving acid breakdown,” Shapiro says. Knowledge is power. Shapiro suggests starting out by limiting foods that don’t have functional health benefits, like alcohol, caffeine, and processed sugar. Then, think about what foods might be causing inflammation for you—because if the rest of your body is reacting negatively to them, chances are your gut doesn’t want any part of them either. “Foods that inflame the gut […] can differ for each individual, and may contain foods such as dairy, grains, and beans,” Shapiro says. But no matter what you decide to steer clear of, she stresses the importance of getting enough fiber (yeah, prebiotics are that important). Ultimately, spring cleaning your microbiome is really that simple. Shapiro just recommends making sure you’re staying hydrated (because what doesn’t hydration help?) and listening to your body as you go through the process to see how it reacts to any new foods and supplements you’re ingesting. After all, if your gut is happy, you’ll be happy.